Heat treating an entire part increases its hardness and brittleness. The hardness is desirable for wear resistance, but the brittleness leads to easier breaking/shearing of the part. Flame heat treating produces a surface hardness without making the entire part brittle. Flame hardening is a heating process where the flame impinges directly on the surface to be hardened. When the surface reaches the austenizing temperature, the part is immediately quenched to produce a hardened surface. Typical flame hardening applications include blades for turbine engines, gears for paper machinery, rolls for the printing and metalworking industries, cams for packaging machinery, machine tool beds, and automotive components. Parts to be flame hardened need to have a hard wear surface, but remain softer in the core. 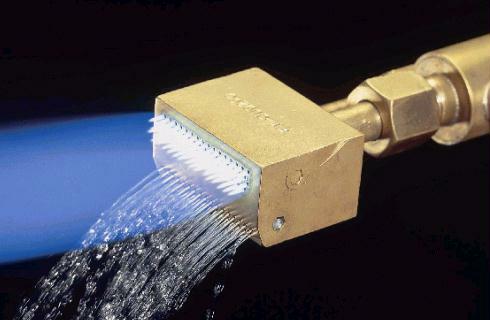 Conventional processes have used oxy-acetylene or other torch gases, sometimes in a hand-held, manual mode. This produces inconsistent results at best. A new process developed by Flame Treating Systems, Inc. (see below) uses natural gas in an automated process to produce highly repetitive results at a much lower cost. Flame heat treating competes with electric induction surface heat treating systems and many applications of round, smooth parts. Natural gas competes with other torch fuels in processes that can only be done with flame heat treating. Natural gas is substantially less expensive than other torch fuels, and when properly designed and controlled, can achieve the same temperatures and results. With the Flame Heat Treat System, custom jigs are built to hold the part and in some cases, custom torch heads are also fabricated. A microprocessor system controls the heating and quenching cycles to achieve the desired result. Once programmed, the result can be repeated for every part. Note in the flame head picture, both water and flame come from the same head, but normally NOT at the same time. This picture is for illustration only.